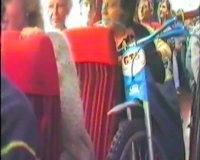 Our review of the new DVD boxset dedicated to the Cradley Heathens. Due to popular demand, we've added the supporters' cup race format to our programme generator. You can find it here. Apologies to those who found themselves at meetings this week with the wrong heat line ups! "I was at those first Belle Vue Colts meetings and can remember Chris coming round the fourth bend at what seemed like a hundred miles an hour, missing the fence with a couple of inches. He was one of the stand out riders with his Red football jersey." "Really sad news of the passing of John Chaplin. I first met him in the 1970's and was stunned at his knowledge and articulation of our wonderful sport. An old late friend of my family had given me a wondrous collection of speedway magazines from the pre-war years up until the late 50's. John eventually purchased them from me at one of the annual "programme and magazine events" at the General Smuts public house at White City during the major meetings held there in the late 70's and early 80's. One of our foremost brains of the sport who will be sadly missed by young and old. His articles weaved the memories of the past. RIP John." "Sorry to hear about John Chaplin's passing. He drew on his memories and historical records to fashion some great articles, and books. The Vintage Speedway mag was a boon to all of interested in the early history of the sport we all love. Occasionally when l felt I needed to suggest corrections he would welcome my thoughts orwewold engage in a bit of friendly debate. There was no doubt he was a journalist through and through rather than a crusty researcher digging into the dusty old newspapers. That did not diminish his contribution as I can acknowledge that he was happy to publish researchers findings in his magazines which is big positive. I hope John is up there with his heroes of the tracks - it is just a pity that he'll not be able share their tales with us. Goodbye John - you will be sadly missed." "Very sorry to hear that John Chaplin is no longer with us. He leaves a really fantastic legacy of documenting a period of speedway history that will forever live long in the memory. Really enjoyed reading the two re-published articles." Sad news this week with the passing of the great journalist John Chaplin at the age of 85. 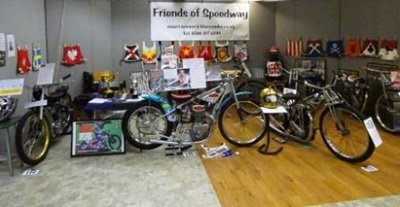 John contributed to numerous publications over the years, including his regular Museum Piece feature in Speedway Star. He also edited Classic Speedway magazine for 10 years and published some marvellous hardback books in collaboration with John Somerville. John was an occasional contributor to this website, so it seems appropriate to bring some of his work back to the top of the site as our small tribute to him. In this first article he looks back on the 1950s, a decade he described as one of one of steady but precipitous decline. John took us back to 1948, a summer in which Speedway had to leave Wembley to allow the athletes to compete for Olympic gold. Steve Haire was surprised to find how riders are paid and wonders whether it's always been done that way. Tracy Holmes concludes his series on the Australasian Finals, reporting on the rather shambolic attempts to stage the 1982 meeting. A new book from teenage sensation Drew Kemp taking a meeting-by-meeting look at his first season as a professional. Tracy Holmes on the 1981 final. He describes it thus - "This meeting was everything a World Championship qualifying round of such magnitude should have been with all the thrills, spills, high drama and shocks." 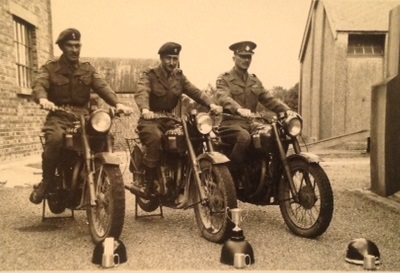 "Here's a picture of the Aldershot team from 1953 or 54 and I am trying to identify the riders. The only one I know for sure is Tommy Sweetman in the centre and I think it's Bob Bunney on the bike to the left. If anyone can offer any further info I would be most grateful." "My dad was a dirt-track racer at Harringay Stadium before the 2nd WW. He was Horace Alfred Butlin but was usually known as Harry. I am pretty sure he raced there in the late 1920s and early 1930s. I have no photographs of him unfortunately. His profession was that of a butcher. If anyone has any record of him I'd greatly appreciate hearing from you." Charles McKay visited Albany on a recent speedway tour of Australia. He's been good enough to send us a selection of pictures for us to share with you. Tracy Holmes reports that a notable omission from the field was a disappointment for organisers and fans alike. "I worked with Chris a Hills Garages in Manchester, I also joined the Territorial Army with him, I think we both joined in order to pass our driving test. I hope he's in good health." "Still got the single somewhere - the only 45 I've got left - although it's probably 30+ years since I played it! I remember buying it: (1) in the vain hope of getting speedway on Top of the Pops; and (2) because Hull had just gone up into division 1 and 'Jimmy Mac' was our new number one. " Do you remember when these shale stars cut a 45? Tracy Holmes with part four of his series.The final no longer ensured qualification for the quarter final stage of the championship, but the increased number of qualifying positions proved significant in the context of the season as a whole. "My family were supporters of the Monarchs and watched the awesome Jack Young from his first races. Ken-le-Breton, the white ghost. Magical times. We were 'third-benders' and it was so good to meet with like-minded supporters. Such happy days and what a clean, honest sport it was." An article from a 1975 edition of Motorcyle News that revealed there was a new generatiion on the horizon at Arlington. The continent's biggest drawcard was missing, but that didn't stop this final from being a classic. Tracy Holmes takes up the story. "I do think its a shame that Jerzy Szczakiel has the reputation of a one hit wonder because from all reports, he was better than that. I think part of that though is that he rarely rode outside of the Iron Curtain so people, especially the Brits, rarely got to see him. And it's not because he didn't want to, but because the Polish authorities wouldn't allow him to for some reason. They allowed Edward Jancarz and Zenon Plech to race all over the world, but not Szczakiel. 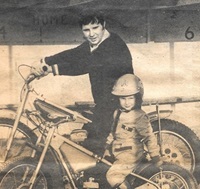 Ivan Mauger definitely recognised his talent though and when he and Barry Briggs were running their troupe's all over the world in the 70s, Jerzy was invited to be part of it, but he was simply never allowed to go. But one thing that can never be taken away from him is that he is a genuine World Speedway Champion. As was said above, there were supposedly better credentialed riders who never even got close to being that. But he did." "Ah yes North of the Border. 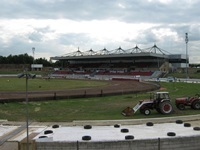 Having paid 11 visits to Glasgow speedway over the years at its various locations including Coatbridge, 2 or 3 Blantyres was it, Shawfield Park and its current track Ashfield. First visit was in 1975 with the Crayford Kestrels losing 25-53 with Trevor Barnwell, George Barclay and Alan Sage as top scores wi th Glasgow having a young Mitch Shirra who was supposed to have been the next Ivan Mauger. Upto the late 80's they tended to be one sided affairs until 1988 when Hackney with their all concoring side won 50-46, again top scorers this time being Chris Louis, Andy Galvin and Mark Loram. I had relatives in Stirling so when on holiday would always take in the speedway and even got to see Willie Templeton's Testimonial a Berwick. From 2006 -2008 having a mate who had a Scottish girlfriend we would stop at her place and do the Rye House northern tours taking in Edinburgh, Berwick and Glasgow. 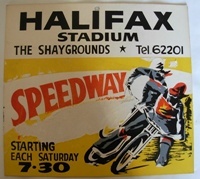 Yes, fond memories of great times, unfortunately now I'll be lucky to see another live speedway match.."
Steve Haire on the heyday of the speedway supporters clubs. Tracy Holmes reminds us of the controversy that surrounded the final in 1977. Friends of Speedway (a non-profit making organisation who are proud to part sponsor the British Youth Speedway Championship) are pleased to announce the 72nd edition of their magazine the Voice which is packed full of interest and enjoyment. This issue is a huge 24 pages, which will keep your interest for hours! In this issue, Charles Mckay asks Where did the money go? Plus Fake news. Roy Delaney's article on Crashes were plentiful. John Hyam on Vic Ridgeon plus Bob Warner. More tales of a wandering nomad plus Ask not for whom the bells tolls from Jeffrey C. Jameson. The Editor reports on the Kempton Park Road Show and scattering his friend around Wimbledon. Sue Towner is on her Soapbox and giving the Accounts of the last year. Slider says, 'Are we at the crossroads or is it now a roundabout?' Followed by much more reading. Available from Friends of Speedway; 117 Church Lane, Chessington, Surrey KT9 2DP. Please send your cheque for £12 made out to the above for four issues of the Voice to Stu Towner at the above address or ring 0208-397 6599 for more information. "Great memories Tracy, especially of Jack Millen and Phil Crump. I was there at Teesside and Rayleigh, still have the programmes. Great days." "An enjoyable article about a really honest rider. I saw him 1960-3 riding for Stoke and always giving of his best." 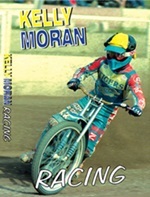 "Got this dvd for Xmas from my daughter it was an excellent watch and didn't just show all the stars at their best likes of Mauger, Gundersen, Moran's all in all a good watch." Released to mark the 90th anniversary of speedway in the UK, these DVDs feature the best 90 riders from the British League from 1970 to 1990. Tracy Holmes kicks off a new series looking back on the Australasian Finals, starting with the first one in 1976. £10 per person - Children under 2 years FREE. Admission includes entry to the Paradise Wildlife Park, Broxbourne, Herts - the home of the National Speedway Museum. The event will be celebrating the 91st Anniversary of Speedway in the UK. It takes place from 11am to 4pm. (Park open 9.30am to 5pm). "'Gentleman' George Barclay will never be forgotten by Sunderland Speedway and its supporters. A true Gentleman and friend to all." "Bob Watts rode for Teesside as a lowly reserve for a short while in the 70s and drove from, I think, Exeter for the pleasure. The fans certainly took to him - he was a trier." "With all due respect to Phil Rice the BBC sports personality of the year event is now no more than an excuse for licence payers funded junket. It is run by control freaks who don't want anyone from sports ignored by the BBC to get a mention. It is a sad fact of T V life that sport now, largely, equals footballl and maybe the other odd thing such as tennis. I see the sports personality on par with the Eurovision Song Competition as a complete load of rubbish and not worth watching. I don't get hung up about it - I just ignore it. Let's face it the BBC just ignores a whole raft of sports and as far as I can see that is not likely to change." Tracy Holmes braces himself for more accusations of 'Mauger bashing' as he looks at the great man's record in the famous Golden Helmet. David Pickles looks back on a memorable trip from Hackney to Hampden in 1971. "Like Bob was at first meeting and last. Always thought that he was the best announcer that I had heard around the tracks. Sadly like Bob my speedway patronage has run its course from a meeting available virtually every night when I was growing up to nothing now. Despite Jon Cook's assertion, there is no accessible speedway to me as a retired personage with limited finance. ( I have always placed Eastbourne on the South Coast). I am left with many happy memories of Arena/Lakeside not least Alan Sage's ability to scatter the other riders should he reach the first bend in the lead by throttling back!!!" "I'd like to nominate "Gentleman" (and he is) George Barclay when he lived in Plaistow, east London, and commuted every Sunday up to Sunderland, around a 750 mile round trip for home meetings. He gave them exemplary service too and I would imagine is still fondly remembered by many in the area. " 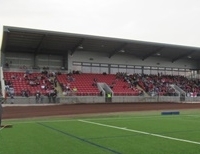 "The largest ever speedway crowd recorded at Odsal was 47,050 for an England vs Australia test on 5 July 1947. England won 65-43 that day. The English side that day was: Jack Parker (c) - 9+4 Norman Parker - 13 Bill Kitchen - 16+1 Tommy Price - 7+1 Alec Statham - 16 Ron Clarke - 7 The reserves were Malcolm Craven and L. Wotton who did not ride. 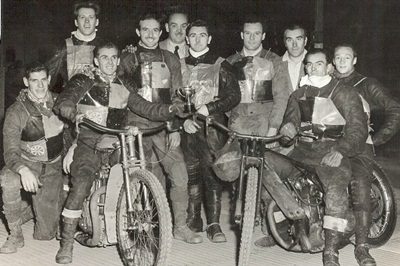 The Aussie's were: Lionel Van Praag (c) - 3 Bill Longley - 6 Vic Duggan - 16 Frank Dolan - 3+1 Ron Johnson - 5+1 Max Grosskreutz - 10 The reserves were Aub Lawson and Ray Duggan (younger brother of Vic) who also didn't ride." "I have every sympathy for Tai getting a nomination be it for say an MBE or being a top three finisher in the BBC's Sports Review of the Year. As far as the latter is concerned the BBC nominated a ten strong shortlist which was only released on the night which clearly was set up to avoid the sort of mass voting that has been seen over the years, In many ways this is a fair way to do it but of course speedway continues to be ignored by most of the media. With low crowds, guest riders and the ridiculous double up and down facility is it surprising? The sport needs an organisational shake up and some sort of medium term plan. Sadly easier said that done." We pay tribute to some of the riders who have taken on marathon road trips to get to their 'home' meetings. Tracy Holmes looks at the third and final test at Boston. Our final update of the year, so time to give thanks to everyone who has contributed or assisted with the site in 2018. Apologies to anyone inadvertently overlooked. Very special thanks to Tracy Holmes who contributes more words to this website than anyone else, we'd be lost without his regular supply of articles. It would be great to see even more names on this list in 2019. Please remember that we're always delighted to publish any speedway related articles or pictures, don't hesitate to get in touch if you've got something to share with speedway fans worldwide. "I dunno, I guess I am a bit old fashioned in a way because I also prefer the old way where while the title was likely to be fought out by only a few. There could at least be a surprise winner on the night like a Jerzy Szczakiel, Egon Muller or even a Gary Havelock. And if you go back even further there were other surprise winners including the likes of Australia's Jack Young who won the 1951 World Final while still a Division 2 rider (though as we know, unlike the 3 mentioned, Young would win again in 1952 and spent the rest of the 50s riding in just about every World Final. He wasn't just a one hit wonder and is still revered to this day 31 years after his death as one of the best ever riders). Should they go back to the old format? Maybe, but the SGP is a money spinner and I can't see them turning their back on that." "Well, correct me if I'm wrong, but I don't believe I am having scoured as much of the relevant websites as possible. Yet another blank year of honours for speedway riders, Tai in particular. A British 3-time world champion, and no recognition whatsoever. An utter disgrace. When will the speedway world wake up and organise a movement to put pressure on the authorities to rectify it? Probably never, given their previous track record (pardon the pun). When one has to listen to the midnight news that someone in the world of Netball is lauded, then I believe all is lost Speedway is finished." 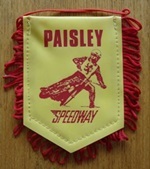 Still looking for a suitable present for the speedway fan in your life? Here's one more suggestion, six hours of pairs speedway from Retro Speedway. Tracy Holmes continues his series on this second division test series in the early seventies. Friends of Speedway took their road show to the Kempton Park Off-road Show on Saturday 1st December. The star of the display was the actual bike that Ivan Mauger won the 1972 World Championship on plus the major awards that he won during that year. Other machines there were a Norton rotary engine speedway bike (the only known one in the world), three JAPs, one in a Staride frame and two in Rotrax frames. Along with various race jackets from different years and picture displays. "I went to school with his sister Anne, I looked up to Chris because he was a biker and used to see him in the pits at Belle Vue and he would say hi. Hope he is ok and his sister too." Long-standing suppoter John Fray takes a look at the current state of British Speedway. Tracy Holmes kicks off a new series, covering the 1972 test series between the English and Australasian stars of the second division. Mike McKnight has sent us this picture of Jimmy Gooch from 1949, just before he left the army to start his speedway career. He'd be happy to pass it on to any of Jimmy's family who may like to have it. Friends of Speedway (a non-profit making organisation who are proud to part sponsor the British Youth Speedway Championship) are pleased to announce the 71st edition of their magazine the Voice which is packed full of interest and enjoyment. This issue is a huge 24 pages, which will keep your interest for hours! In this issue Charles Mckay investigates the reasons behind meetings being postponed or abandoned. Roy Delaney's tribute to Ronnie Moore. 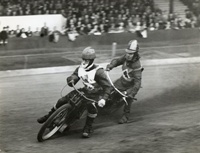 John Hyam on speedway riders turning to midget cars. More tales of a wandering nomad from Jeffrey C. Jameson. More on the Swindon development - good or bad news? The Editor reports on the 13th California Reunion. Sue Towner is on her Soapbox praising our Tai on another World Championship. Slider says, 'What Crisis?' on the state of domestic speedway. Bibliophiles Corner reviews the Barry Thomas book ThommoHawk. Followed by much more reading. "I don't know why the BSPA don't try to buy the stadium. It had two enclosed grandstands, a bar on the 4th bend, a gym underneath the main stand and a reasonable size car park with a fair amount of street parking and as a frequent visitor over the years I found it always produced good racing. I'm sure as long as it was run as a community asset the council would give their backing and it could be developed into a successful business. I met Dag Lovaas at the Hackney Reunion at Paradise Wildlife Park where the Speedway Museum. In 1977 when White City won the league Dag was signed to them but they finished up using rider replacement for the whole season (think Wolverhampton had done it previously with Jon Erskine), I jokingly asked him if he got a winners medal, he didn't. So daft decisions happened even back then and if memory serves me right White City had finished their season early and Wimbledon wanted to sign Trevor Geer and Paul Gachet. They weren't allowed to but it goes to show what they tried to get away with. Lets hope someone can get Oxford up and running and there's enough riders to go around. " "The Speedway Rider is Joe Bowkis. He road for Harringay, Poole and Leicester." Some great pictures of the Edinburgh Monarchs v Arena Essex Hammers meeting at Powderhall in 1986. Thanks to photographer Ray Davidson for digging these out for us. John Fray was present when former favourite Dag Lovaas made an emotional return to Oxford. Martin is a former rider from California who shares his thoughts on all things speedway. A new production from the team at Retro Speedway that looks back on classic action in the big smoke. Tracy Holmes on Jason Doyle and the Czech Golden Helmet. Stu Towner reports from the Calfornia Reunion on the 14th of October. "I agree Dave. Shivers are still there. I am not an expert on engine positions but lay-downs were tried years ago and did not catch on. I am not sure why they are now universal. As for attracting the younger generation, the track I attend most is awash with family groups in the stands from babes-in-arms to teenagers. Some of the children have their own trundle bikes and whizz around the place with considerable skill. In addition there are young riders on 50cc (I think) machines practising after the meetings as well as slightly older lads (and one lass) on bigger bikes. So maybe where I go is exceptional but I hope it isn't. " 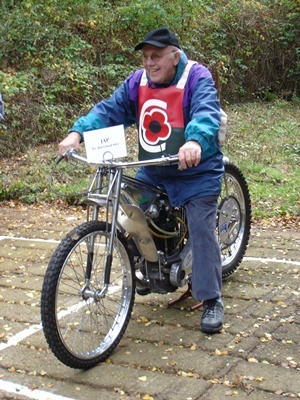 "I'm sad to report that my great friend Dave Slater passed away recently at the age of 88, Dave was a rider for Rye house speedway team in the 50s, he rode bikes up until his 80+ years and was an active member of the AJSMOC, he built some excellent single engine bikes in the flat tracker style, at the age of 76 he bought a new Harley Davidson sportser which he liked but always prefered his Matchless single, it was fitting that two of the specials he built out of auto jumble parts were ridden to the service on the day of his funeral. R.I.P Dave we miss you lots!" Tracy Holmes looks back at the clashes between Peter Collins and Ole Olsen during the 1975 season. Friends of Speedway are pleased to announce the date of the above reunion to be held on Sunday 14th October 2018 from 11am to 4pm at the Country Park, Nine Mile Ride, Finchampstead, Wokingham, Berks, RG40 4HT, where the speedway took place. There is an hourly bus service, number 3B from either Reading or Bracknell Rail Stations and stops at the entrance to the park. All are welcome to attend and bring any memorabilia that you may have or of interest to others. "I would appreciate information on Gil Goldfinch's cousin John, who was a photographer and in the mid-1950s in my brief spell working at 'Speedway Star' co-operated with me on various photographic feature. 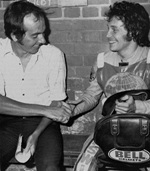 I especially remember working with him when we did 'Rider At Home' features - among those featured were Ron How, Graham Warren and dear old Phil Bishop." "Public Interest. Most of the minority spectator sports have something in common which generates public interest. Nearly all of them involve sports in which anyone can (or can imagine) themselves participating. Speedway does not lend itself to this advantage. Gone are the days when there was a cycle speedway track on every street corner. Is this a possible factor which contributes to our woes? Be glad to hear your views." Sandor offers a Hungarian perspective on the speedway world. "Handicapping. We already have handicapping when under penalty. More often than not the handicapped rider starts at the back and stays there. What pleasure we are expected to get from heat leaders theoretically passing inexperienced reserves baffles me. The result would be the same anyway in this theoretical system. Agreed some races are processional but many are not. Track preparation and design providing more than one racing line would be great help. " "Very interesting article, and one of the few with a new angle, and backed up by data and not just opinion ("Bring it back to Wembley" etc.). This discussion may well go on for a long time. For example, of all the qualifiers that went towards getting to a World Final, how many of these were exciting, how many of the races really counted etc. I'm sure that TV money has something to do with having a GP series as well. Amongst the major motor sports, Speedway was unusual in that it kept the one-off World Championship for a very long time, so perhaps it was just time to fall in line with the rest of the world. Actually regardless of the standings, i.e. the winner is known before the last GP, I think all of them are eagerly anticipated." "Great fun mate. This is for those who say ... If Dave Jessup had won his four remaining heats after his ef in 1978, I would say he should have won the Gold Medal. But he did not, beaten by Gordon Kennett in round 5. Then he lost the Bronze Medal run-off. That, for me says his first round ef did not cost him the World Title. And Chorzow was not Jerzy Szczakiel's home track. Cheers !" "With out a doubt, one off final. Went to a few at Wembley. Not knowing who would win or be placed to the end. As the article say's sometimes you know who is World Champ with a couple of GP to go. " "Great article re Arena first match. I was at the meeting as Clerk of the Course. Had that position for 4 seasons then took over the announcing from Dave Lanning and was announcer for 25 years having to give up due to failing eyesight. 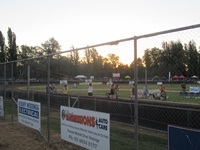 I miss speedway, it has been part of my life since I was 5 years old. I was asked to go to the final meeting and I closed the meeting and the life of speedway there. My voice was the last heard and I was honoured to be asked to do that - sad as it is." Ken Nicholson has had the calculator out and produced some interesting facts and figures contrasting the World Final and the SGP. A definite end-of-an-era at Lakeside this Friday as the track stages its last meeting. In this article from 2006 we looked back at the very first one, in April 1984. 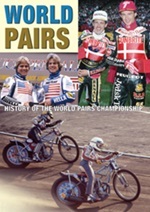 "Great articles, love speedway, used to watch Arena Essex. We want a speedway team near or in London, the capital city and it has no speedway. 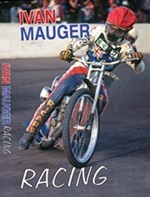 Watching the Polish and Swedish speedway, it makes you salivate for a London team, would be nice if we could have speedway at the London stadium or Spurs new ground, instead of that American football, but money talks..."
A review of a new double-DVD devoted to the late, great Ivan Mauger. 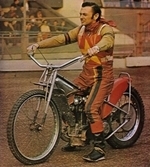 And Jack Millen was our speedway hero. " "Very well put. Everything makes sense. A lot of info that should be considered and implemented for the long term plan. " "Thanks Steve, for voicing your discontent so eloquently, I am sure your comments reflect the thoughts and opinion of the silent majority. I was an avid fan until 1973 when I moved to Canada. Now my speedway fix is restricted to "youtube" and an occasional trip to Cosa Mesa when visiting my daughter in LA. It sounds like the British promoters could learn a lot about putting on a fast paced and entertaining show from the Oxleys." 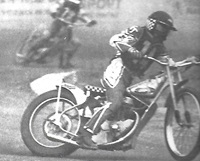 Steve Haire once spent several days a week watching live speedway. Due to track closures he's no longer able to attend at all. Here are his thoughts as a 'lost' fan. 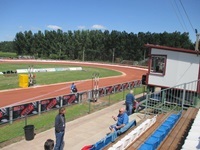 Thanks to Harry Susemihl for pictures of this brand new track in Hungary. 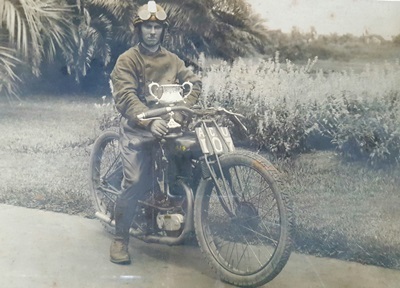 "I'm searching for information about my grandfather who rode speedway in the 1930's, his name was Maurice John Murdoch, pictured here on his machine. He was from the Taree area and rode along with Van Pragg and Jack Pattman, any information would be appreciated." Very sad news today with the passing of the great Ronnie Moore. As our tribute, we repeat this article that Dudley Jones wrote in 2009, sharing his memories of the legendary Kiwi. Charles Mckay was in California recently on the Travel Plus tour and visited this track to experience "The Commotion by the Ocean". David Pickles advocates the appointment of an independent thinker at the top of the sport. The 70th issue of The Voice magazine is now availalble from Friends of Speedway. It includes an obituary for Jim Gregory along with articles on charity, Ron Johnson, Vic Collins and other topics. Available from Friends of Speedway; 117 Church Lane, Chessington, Surrey KT9 2DP. Send a cheque for £12 made out to the above for four issues of the Voice to Stu Towner at the above address or ring 0208-397 6599 for more information. "As the author of the Neil Street book I invite constructive input. Jock states there are mistakes. I contacted many people for input and the names are all listed. Invitations were sent to everyone I knew. The book was approved by Phil Crump and has been read by Bob Street and many close friends. If there are mistakes that detract from the spirit of the contents these can be noted in an Eratum in all future copies until such time there is a reprint.There was a deadline and there were several people that came back after the deadline. If I am provided with a list I will ensure they are noted. Neil had so many friends there will be different points of view, but overall I thought we gave Neil to credit he was due." Ken Nicholson makes a welcome return to the site and reflects on the current state of play in British Speedway. "Mistakes made twenty years ago can be forgiven. What is not acceptable is the pretence that everything has been hunky dory and that a few tweaks to the rules would put everything right." Mark Dell pays tribute to Kelvin Mullarkey, the legendary Rye House Rocket who passed away recently. "He was a character, a great competitor, a fantastic captain for the Rockets and at times a controversial opponent." 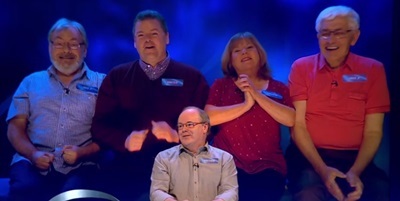 Many congratulations to Speedway Plus contributor Peter Colvin for his starring role on the BBC's Eggheads programme this week. Peter single-handedly defeated the quiz experts in the final showdown, winning the £7,000 prize pot for him and his fellow Glasgow Tigers fans. Even better news is that the team have generously gifted £2,000 of their winnings to the Speedway Riders Benevolent Fund. Well done to all involved. "Firstly can I say how pleased I am that we have a book on my good friend Bill's life. There are however several "howlers" I've spotted already & that's just in the previews! It's a pity that Carole, Graham, Andy or Bills brother Bob did not read the copy prior to it's publication. So please don't take it as fact because that what it says it in the book!" 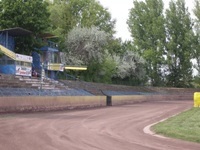 Charles McKay took these pictures at Belle Vue during a recent pit walk and visit to the centre green, excellent benefits offered to season ticket holders. Details of a new book by Tony Webb on a legendary rider, innovator and team manager. "I was in Sydney when I heard the news that Mal Carmichael had died. I met him in Townsville when he was doing the speedway circuit with Peter Bradshaw. I was only 17. We had a relationship and I followed him to Melbourne. I was smitten, oh the memories. Still think of him after all this time. RIP Mal." "Difficult early years, then they changed the track and widened the corners. Great racing with George Hunter, Neill Collins, Davey Trownson and visitors like Bruce Cribb. Wonderful to remember Carlo Biagi's testimonial with the Collins bros and Tony Briggs. Not quite Old Meadowbank but near it! " "I am amazed at the lack of foresight by speedway administrators that has allowed the sport to decline to the stage where it has no public appeal particularly to the younger generation who are so critical to speedway, as we know it, long term survival. To be at the stage where we cant get a few hundred extra to keep Rye House going where as the sport used to fill Wembley is unbelievable, Most races are processional with no passing or change of position and you can write the result in your program before the start of the race or at the latest after the first corner. Consequently there is no spectacle or excitement compared to the days of the upright engines when bikes were harder to ride and we had contrasting foot forward and leg trailing styles. To survive spectacle, uncertainty and excitement must be re introduced into the sport and there is only one way to do this handicap racing. Having spoken briefly to Keith Chapman at a Polish GP event a couple of years ago it is obvious that for some unknown reason the sports administration are totally opposed to handicap style racing and content to let a great sport continue to slide into history without making the radical changes necessary to save it. " Step back to 1984 and join us and the Halifax Junior Dukes for an eventful charabanc trip to Berrington Lough. Milton Keynes rider James Jessop share his thoughts on the past, present and future. "Has anyone the early edition of Speedway News which, if my memory serves me correctly, carried a photo of one of the UK royal princes. Was it the future King George VI then known as Prince Bertie? King Alphonso of Spain was reputedly a fan of the pioneer racesrs. 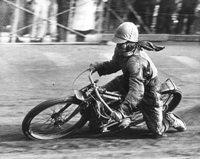 By the way the only enobled dirt track rider was Lord Craigton! As Jack Nixon-Browne he had promoted and raced at Carntyne, Glasgow in 1928. He later became a Tory MP and continued in politics in the Lords." "This idea has some merit. It would most certainly make the crowd feel involved but could also turn the meeting into a sort of Pantomime with the heroes and villains paraded in front of everyone. Would it also be fair for the top points scorer to find all of a sudden their hard nights work is rewarded with the worst gate? Also you could guarantee which ever country is staging the meeting the odds would be stacked for their riders should they make the semis/finals. Great thinking outside the box though Tracy, keep it up. " "It seems I'm always replying to Dave Pickles observations. I think the reason is we're of the same sort of age and have always been passionate about speedway. I was going to Rye on Wednesday to see Belle Vue but decided against it. I don't think the fixed race night is the reason for the decline in spectators. A fixed Wednesday race night should have freed up more foreign riders but then they allowed Swindon to be exempt and also limited teams to one 8 point rider. You have no continuality, having to wait 3 weeks for another home meeting then not knowing how many of your or the opponents team are available. This is the reason people are not going. I've got used to not going speedway and the reasons I didn't bother that Wednesday are the track produces poor racing, and Rye were missing 2 riders who's doubling down Championship teams had priority over their services. Saturday nights I spend down the pub with my mates reminiscing about the good old days of speedway, not about looking forward to the next meeting. Like most sports you'll always have your diehards who'll go week in week out no matter what but unfortunately in speedway they're not being replaced by new supporters. British speedway needs to realise sport is about competition where the strongest not only survive but prosper. On a ironic note I hear there's talk about a new northern track opening at the same time there's talk of Buxton closing through lack of riders. Perhaps trebling or quadrupling up or mechanics and promoters races to make up the teams. Perhaps even betting, and although betting on the final score might be illegal you could bet on the number of guests your team will have. Lastly RIP Kelvin Mullarkey, unfortunately characters like him political correctness doesn't allow, with perhaps Nicki Pedersen being the exception. Perhaps that's what's missing, characters. " "Could not agree more with David Pickles comments." 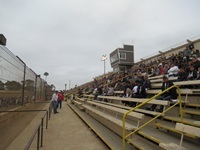 "Hello from California, I'm former 2nd Divsion speedway rider, I competed here in southern and central California in the late 70's to the mid eighties and speedway here in California is in pretty dismal shape compared to its heyday back when I was riding and we were sending our best to compete in the British league we still had lots of riders here putting on a pretty good show. I sure hope you all over there in Britain can overcome your issues and bring speedway back to its former glory that the British League has always been in my eyes the epicenter of speedway. The tape rule here in California has been you are excluded if you break the tapes. " Tracy Holmes suggests that it's time to appeal to a younger generation by letting them use their mobiles to influence events. David Pickles went to Rye House on Wednesday and concludes that fixed race nights are having a devastating effect. Does anyone have further details of any of these meetings? In particular, was the meeting against the Yorkshire Select ever staged?" 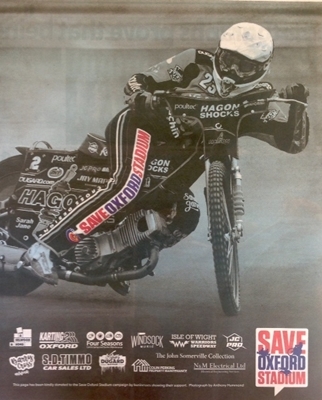 Good to see the Save Oxford Stadium campaign is continuing to raise awareness with adverts in the Oxford Mail. Thanks to John Fray for sending us this scan of the latest one. "The hospitality blocks only just encroach on the 3rd and 4th bends. The Tony Mole plans actually left them in place, but obviously some form of raised fencing would be needed." "Re: Handicapping.. Being a similar age to Dave Pickles we've probably both 'read the book, worn the t-shirt and seen the film' as the saying goes. Handicapping would be a backward step as is with the reverting to the old tactical substitute rule of replacing a rider off form with a better rider. Every year they muck around with the rules to try and make all teams equal in stregnth in the belief closer matches are going to get these mythical non speedway supporters to start following speedway. Sport is about competition to see whose the best, not to penalise good teams to give everybody an equal chance of winning (Speedway Nations a good example, Poland usually winning the World Cup so lets reduce it to two man teams, thus giving other nations a better chance of winning). If speedway needs to take a backward step, then go back to 1968, have two leagues, no track sharing, no doubling up, no maximum team averages, riders on contract and loaned out if surplus. That way you could have a workable promotion and relegation where teams are formed on what the promotions can afford." "Missed the really good Leicester teams but what a great racing tack - really difficult to emulate. Spent a season watching a late Arriving Johnny Boulger, Gary Middleton and the fantastic Ila Teromma (unbelievable at the Riders Championnship at Belle Vue) try to cope with top flight opposition. Fantastic track!,,,"
David Pickes reflects on the latest honours list, the Speedway of Nations and the heir to the throne's love of bikes. Tracy Holmes pays tribute to the latest edition of Backtrack, while also sharing his personal view on some of the claims made within it. "Just been in touch with Nathan Murray who was selected to ride and appears in the programme at number 6. Sadly, he was unable to travel due to a lack of funds. So adding to the scorechart; NATHAN MURRAY Q ns." Tracy Holmes looks back at some heroes and villains that made an impact during world championship qualifying. More items from the collection of Bill Hamilton.